Clinton and Sanders Battle for Orangeburg, S.C. 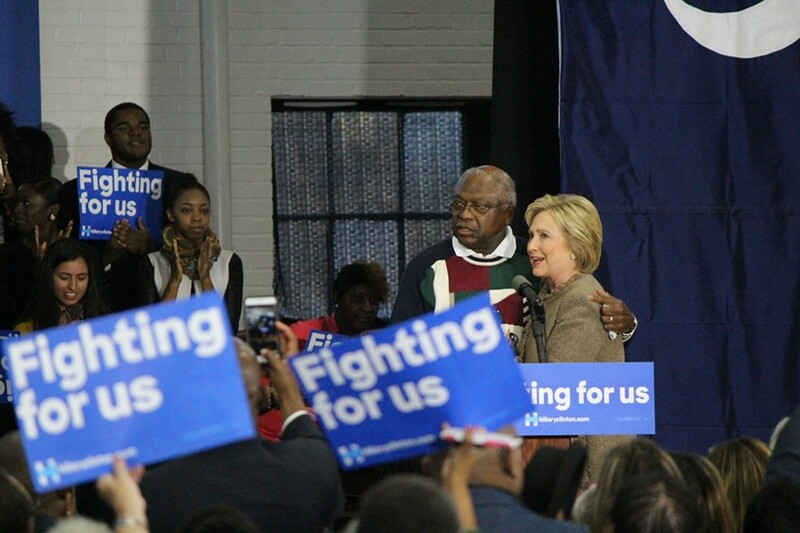 Congressman James Clyburn and Hillary Clinton Friday in Orangeburg, S.C.
On the eve of South Carolina’s Democratic presidential primary, former secretary of state Hillary Clinton and Sen. Bernie Sanders (I-Vt.) nearly collided in the city of Orangeburg. The two held competing rallies Friday afternoon at neighboring schools — South Carolina State University and Claflin University — less than a quarter of a mile apart. Then both candidates dropped by an oyster roast and fish fry hosted by a local politician at the county fairgrounds — barely missing one another. The close encounter was a rare moment of drama in a race that, in the past week, has become a bit of a snoozer. Since losing the Nevada caucuses last Saturday, Sanders has all but conceded South Carolina, where he has long trailed Clinton in the polls. He spent much of the week outside the state. Speaking in Orangeburg, which is three-quarters black, both candidates sought to appeal to the African American voters who will decide Saturday’s election. 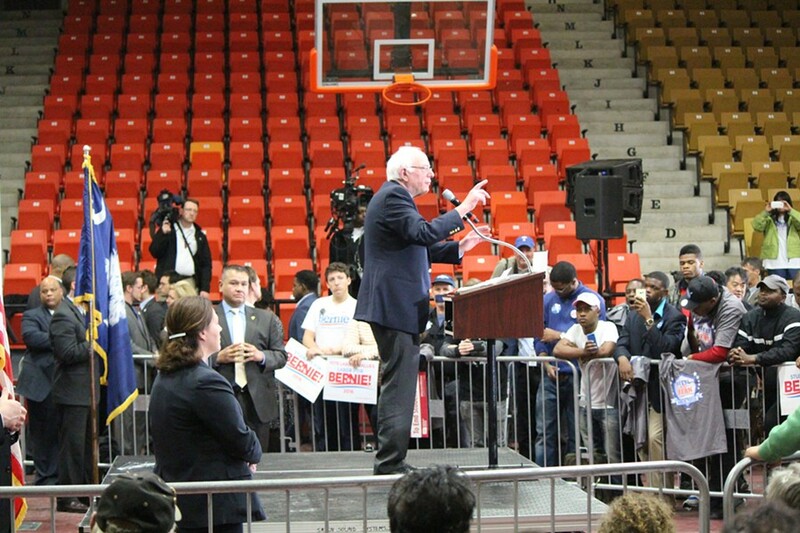 Sen. Bernie Sanders Friday in Orangeburg, S.C. Joining Clinton at the school were a number of prominent supporters, including the singer K. Michelle and Congressman James Clyburn (D-S.C.), the third-ranking House Democrat. 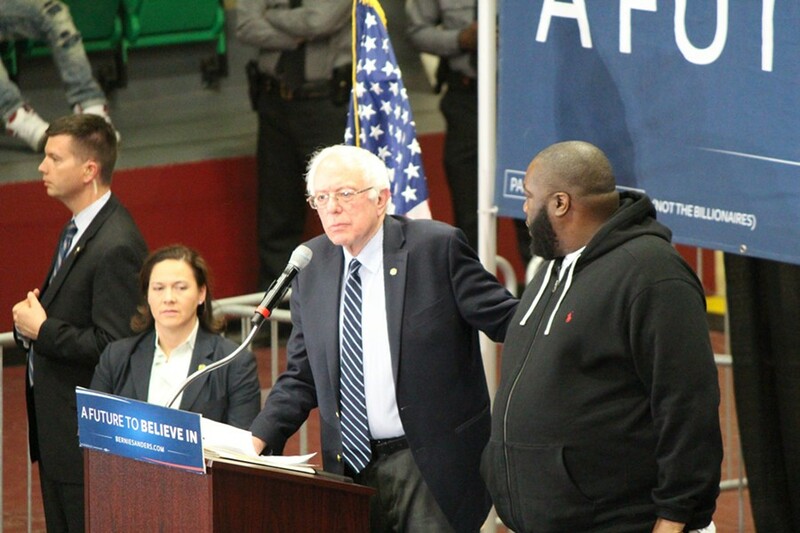 Sen. Bernie Sanders and Killer Mike Friday in Orangeburg, S.C.
Killer Mike, whose real name is Michael Render, hailed Sanders as a champion for civil rights. “For the first time in my life, I am seeing a politician call for true equality by way of policy and not asking me to wait,” he said. The rapper also tweaked the Clinton campaign’s characterization of South Carolina as a “firewall” — or a state it could count on if it ran into political trouble elsewhere. “That goddamn firewall got a crack in it,” he said. In addition to his usual focus on economic inequality and money in politics, Sanders addressed voting rights, criminal justice reform, the death penalty and African American unemployment. He also continued his attack on Clinton’s support for the Welfare Reform Act of 1996. 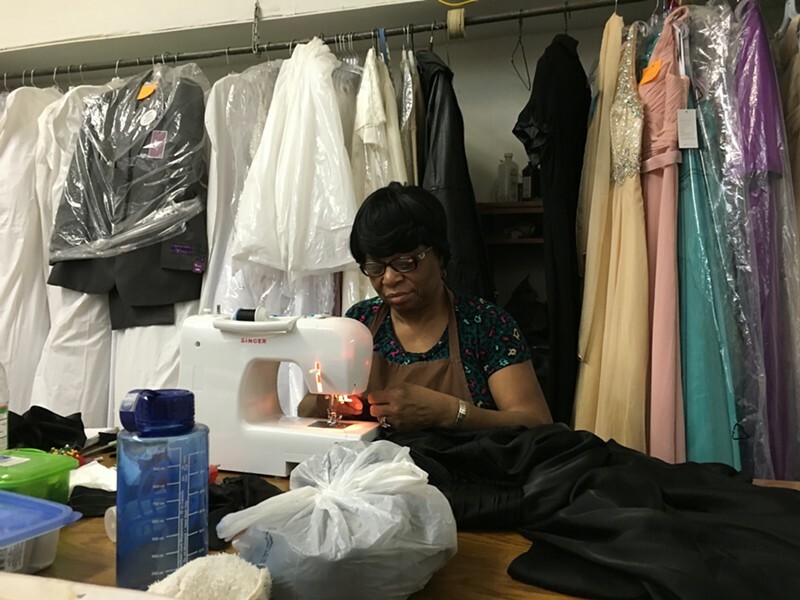 Arleather Hampton at Final Touch Bridal in Orangeburg, S.C. Most recent polls have indicated that African Americans are far more likely to support Clinton than Sanders, but young voters tend to favor the Vermont senator. 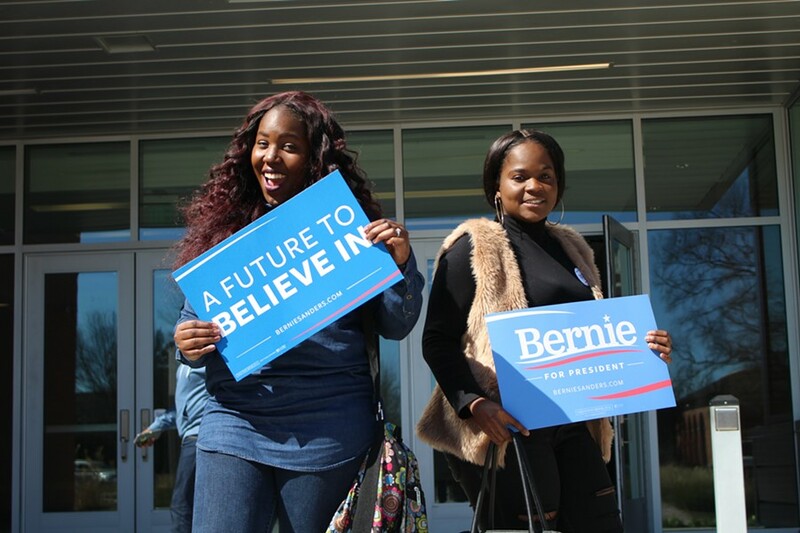 That divide was apparent in Orangeburg, where many older residents interviewed downtown said they planned to support Clinton, while students on the two campuses said they were feeling the Bern. A lifelong Orangeburg resident, Hampton said the most important issues to her were “gun control and ladies being paid the same as men.” And Clinton, she said, was best equipped to fight for both. Like several people interviewed, Hampton said she'd like to see former president Bill Clinton back in the White House. Across the street from Final Touch Bridal, 79-year-old Bobby Williams sat on a bench outside the BlueBird Theatre. He said he had been following Hillary Clinton's career since she was first lady. Williams, who said he was looking for work and depended on Social Security, did not mince words when it came to Sanders. 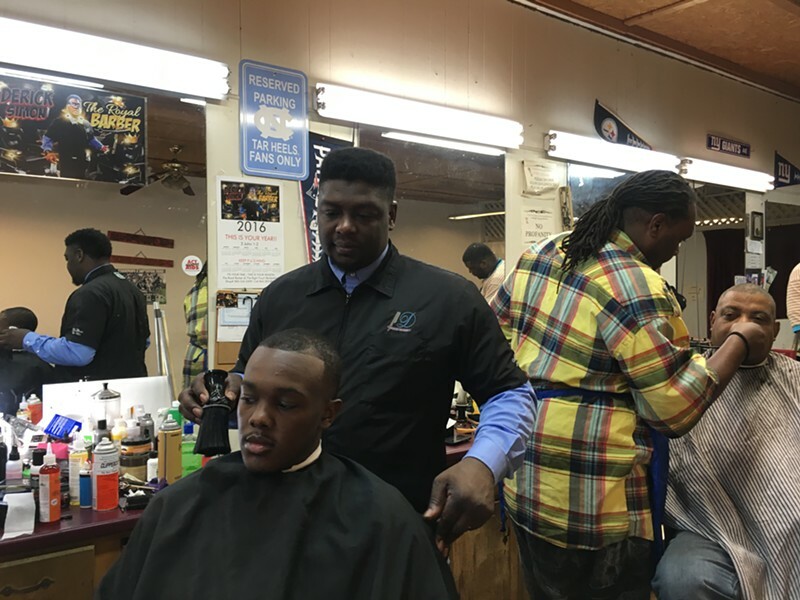 Barber Derick Simon at the Right Touch Barber Shop in Orangeburg, S.C. Inside the Right Touch Barber Shop, Ed Rivers applied the clippers to one of a half dozen customers looking for a trim. He said he was most concerned about the cost of health insurance and college tuition. Zachariah Johnson, a 44-year-old assistant manager at a furniture store, was among Rivers' customers. He said he hadn't quite made up his mind between Clinton and Sanders. A mile away, on the Claflin University campus, Sanders seemed a far more popular choice. As for Clinton, Brown said she simply wasn't familiar with the former first lady. Ayanna Chadwick, a senior from Charleston, said she also expected to vote for Sanders. Across campus, Asia Folk said she thought Clinton would bring more experience to the office and worried that Sanders' plans weren't realistic. But she sounded like she still might vote for the Vermont senator. Patrell Rogers, a junior from Florence, S.C., said he and other members of the Claflin basketball team planned to check Sanders out in person Friday afternoon.